Listen to "Green River, Running Red" on your iOS and Android device. 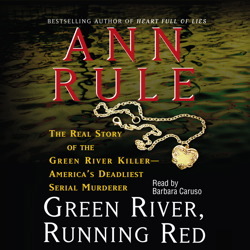 In the most extraordinary journey Ann Rule has ever undertaken, America's master of true crime has spent more than two decades researching the story of the Green River Killer, who murdered more than forty-nine young women. For twenty-one years, the Green River Killer carried out his self-described 'career' as a killing machine, ridding the world of women he considered evil. His eerie ability to lure his victims to their deaths and hide their bodies made him far more dangerous than any infamous multiple murderer in the annals of crime. A few men eventually emerged as the prime suspects among an unprecedented forty thousand scrutinized by the Green River Task Force. Still, there was no physical evidence linking any of them to the murders until 2001, when investigators used a new DNA process on a saliva sample they had preserved since 1987, with stunning results. Green River, Running Red is a harrowing account of a modern monster, a killer who walked among us undetected. It is also the story of his quarryof who these young women were and who they might have become. A chilling look at the darkest side of human nature, this is the most important and most personal audiobook of Ann Rule's long career. This is an excellant read! The narrater does a great job as well. It is hard to believe that this actually occured. Do not hesitate to rent this. This book pulls you in immediately and keeps you engaged through to the end. I caught myself responding outloud to some of the details I was hearing. It covers the stories of the murderer and each victim to the point you feel you are almost there. I could not wait to get in my car to hear the next pages. This book was true crime and in places had gruesome details. Very good though! Very good. A gripping but concise and touching telling of the lives of the many young victims and the unexplainable creation of a notorious serial killer. Well written and movingly read. Fascinating, well written book. You really feel like you are a part of the investigation. I really enjoyed this one. Hard to imagine just how these people think, Ann really helped.The way she wove everything together made it unfold as it happening. Excellent book. The first true crime book I have listened to. Based on this book, I will be reading more. For people that enjoy books based on true crime I thought it was an excellent book and would highly recommend. An easy listen and very informative. A very concise summary of events covering more than 20-years. Highly recommend. Living in the pacific northwest has brought this story close to home. I remember the fragmented and often untrue articles in the newspaper. It was a pleasure to finally get the whole truth about a horrible monster. I have read several of Ann Rule's books and find them all great.